Be inspired and get creative with our fantastic LEGO® exhibition Bricks Britannia: A History of Britain in LEGO Bricks, features 30 stunning models built by Bright Bricks, the leading company for LEGO brick creations, including a show stopping 8m long model of the Flying Scotsman, the world's most famous steam locomotive, with light, sound and smoke effects. Iconic moments in British history, from the Stone Age to the 21st Century, will be presented in LEGO® bricks at this exciting new interactive exhibition coming to The Beaney this February Half Term. Using over 150,000 LEGO bricks, this is a must-see exhibition for the whole family, and a real treat for LEGO brick fans. Your ticket will also include a unique opportunity to dive in and let your imagination run wild in our 70,000 piece LEGO Brick Pit! 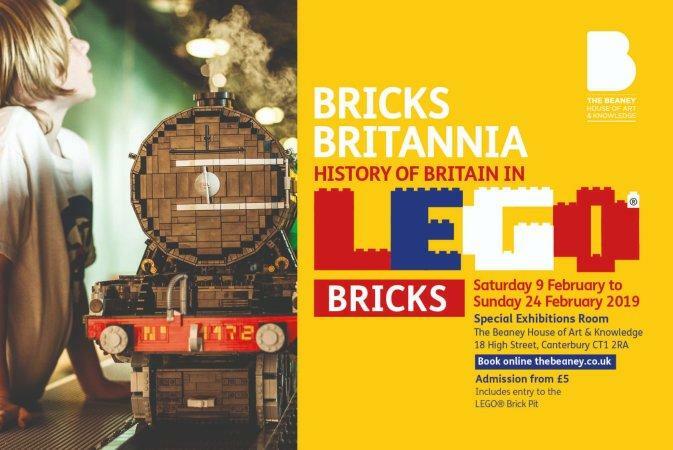 Bricks Britannia: A History of Britain in LEGO Bricks opens at The Beaney on Saturday 9 February 2019 until Sunday 24 February 2019. Admission is £6.50 for adults, £6 for concessions and £5 for children (under 3’s go free).